Well 2012 is drawing to a close and another year of the photo of the day is coming to and end. Here to end out the year is a photo of the sunset taken from Kamehame Ridge. I like the using a sunset photo to end the year. 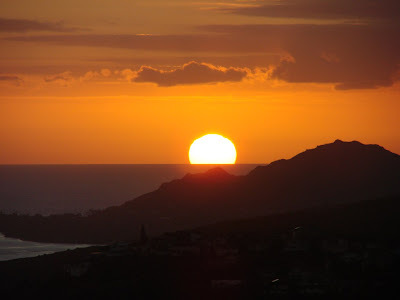 Its been awesome sharing photos of Hawaii with all of you for the past six years. I am looking forward to 2013 and another year of Hawaii photos. I wish you a Happy New Years Eve! Here is a photo I took from Hawaii Memorial Park on Bob’s Christmas Lights Walk. 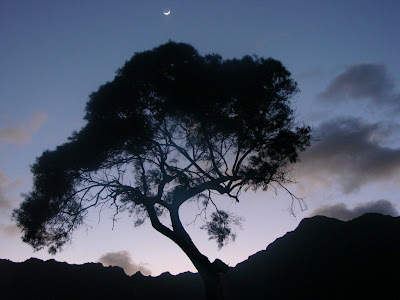 Just after sunset the moon hovered over this tree and the Ko’olau mountain range allowing a nice artistic shot. My only wish was that some orange clouds could have been in the background. Hope everybody enjoys the last weekend of 2012. It time to end the Christmas series and prepare for the new years. I figured a fitting way to end it would be with a nice display of presents. I had the privilege this year of working with HWMG and their Adopt A Family and Angel Tree projects and these are some of the gifts we donated. I also was able to help our Yelps giving tree at their holiday celebration. 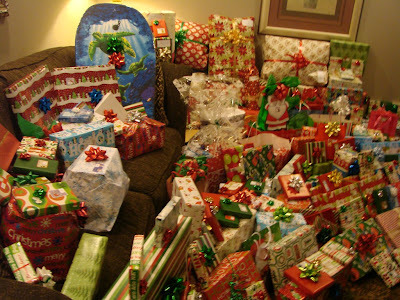 I hope that the many gifts provided could help brighten the holidays for those family going through some hard times. Its nice to know that I was part of helping make some kids Christmas morning.